Now, for some reason it is a conceit of the White House and State Department that none of Jerusalem, both the western part that has been under Israel’s continuous control since 1948 and the eastern part that was occupied by Jordan from 1948-67, belongs to Israel. Perhaps this dates back to the partition resolution of 1947 – which was never implemented because it was rejected by the Arabs – that suggested that Jerusalem should not be part of either an Arab or a Jewish state, but rather should be placed under UN control. 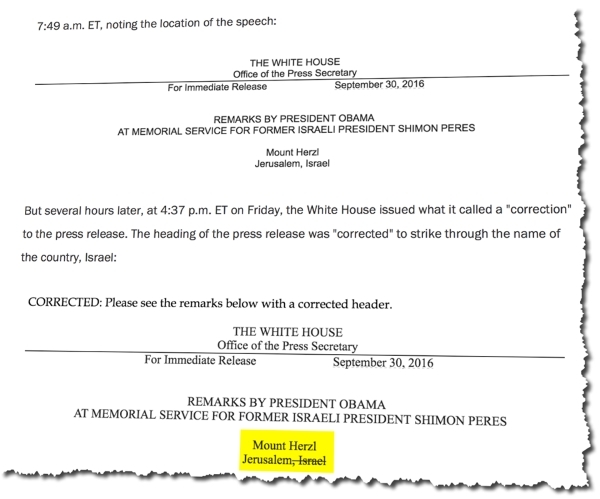 In any event, the White House felt that it was unacceptable to let the “error” in its press release stand, so it issued a “correction” – with the word ‘Israel’ crossed out. Yes, I know. That’s the convention for press releases. But you know, here in Israel we are a little sensitive about being crossed out, or not appearing on maps, or even being wiped off maps. And after all these years that Jerusalem has been our capital – since 1948 – don’t you think the White House and State Department ought to face reality? In other words, according to Barack Obama, the reason the Palestinian Arabs do not have a state is that we are prejudiced. Racists. Apartheid-niks. With Obama, it always comes down to this. The guy who grew up in a privileged family, who went to the best schools and universities, who was elected to national political office with the absolute minimum of qualifications, has a massive racial chip on his shoulder. Never mind that the Palestinian Arabs want to create a state that will have no Jews in it, or that they insist that there is no such thing as a Jewish people (from the representative of a ‘people’ whose peoplehood dates to the 1960s), or that their media makes a habit of inciting their youth to go out and stab or run over Jews. Nope, no prejudice here – just “frustration” and “despair” that they haven’t been able to realize their “dreams,” which happen to be about killing Jews and taking their country. One wonders if it might be possible to take the President and State Department – which as far as I know do not refuse to recognize the capital of any other country in the world – more seriously when they talk about prejudice if they stopped applying their offensive double standard to Israel. I’m unable to adequately describe just how much I enjoyed reading your previous two blogs. I love your comment about Bibi so much! He is the solitary leader in our world that I greatly admire and profoundly respect. I am deeply grateful for your writing! This blog is an outstanding analysis of Obama’s hostility. Reading it has dissipated much of my anger at the obvious bias and anti-Semitic thinking that obliterates reality for Obama and his administration. I have come to believe that he is a very small and evil man. Shanah Tovah Umetukah to you and your family.